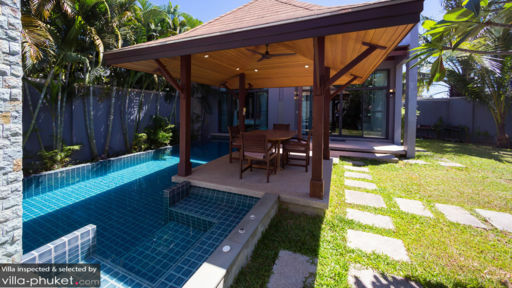 A restful holiday in Phuket begins at Villa Hanga. With a beautifully manicured garden, private pool, homely living spaces and a sparkling pool, you certainly won’t be lacking in amenities at this well-equipped home. A total of three bedrooms accommodates six guests, making Villa Hanga a great bet for small group getaways. Beach lovers will appreciate being located a skip away from the coasts; the shores of Naiharn Beach are just a three-minute drive away! Three finely appointed bedrooms sleep six guests at Villa Hanga. All rooms boast spacious interiors and views out to the garden, and come equipped with a plush king bed, ceiling fans, air conditioners and private en suites. Towering palms, manicured lawns and lush hedges create a picturesque outdoor compound at Villa Hanga. Here’s where guests enjoy gathering for lazy sunbathing sessions, refreshing dips in the L-shaped pool and alfresco meals in the outdoor sala. 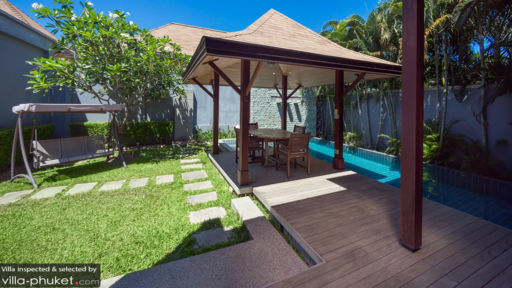 A swing set beside the pool offers a comfortable spot for relaxation and taking in the warm tropical breezes. The common area at Villa Hanga are bright and inviting, with soft cream colours and modern furnishings filling up the space. Expansive glass sliding doors let in plenty of sunlight, and provide easy access to the pool and garden. Sink into the plump, pillowy seats of the couch for a leisurely afternoon spent lounging in, whip up a feast in the fully equipped kitchen or relax with a cup of coffee in the six seater dining suite. Hanging lamps and artworks in eye-catching hues add pops of colour within. Housekeeping and security services, along with laundry facilities are included with your stay. A baby cot is available at request. Airport transfers may be arranged at additional cost. 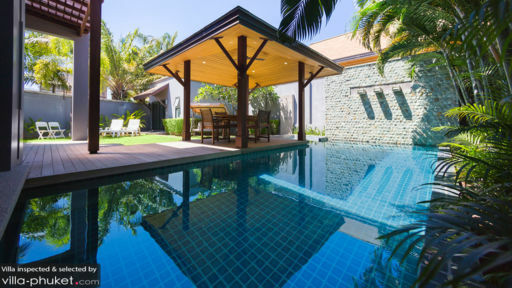 Villa Hanga puts beach lovers within close proximity to the coasts (Naiharn Beach is just a three-minute drive away!). Dining options are aplenty, with a variety of restaurants located a stone’s throw away. Take a brief three-minute stroll out, and you’ll soon be surrounded by eateries dishing out Thai, French, German and Italian fare. Enjoy the convenience and accessibility of having supermarkets, spas and boutiques located within walking distance of the villa. Rawai Beach is situated nearby, and if you don’t mind a slightly longer ride, the beaches of Kata Noi and Kata are about a 20-minute drive away. Other locations located close by include Windmill Viewpoint, Phromthep Cape, Karon Viewpoint and the spectacular Big Buddha.